On the Home page of the Fuzzy Red Socks web site you are invited to answer questions to confirm just how stressed you are. If you answer “yes” to many of the questions you may be experiencing too much stress and your health could be at risk. No one seems to argue that less stress is best – and reducing stress is a fabulous way to self-care. Most of us probably don’t need to answer a bunch of questions to know our lives are filled with more stress than we’d like. But what we may not know is that simple self care techniques can go a long way towards a less stressful life. 1). Create an environment that promotes stress management. This could be achieved by promoting activities like taking short naps at work or home, getting 7-8 hours sleep a night, taking meditation breaks, walking during lunch and standing at your desk instead of sitting, engaging in chair yoga during breaks, having fun at work, etc. 2). Create a mindset that says I will make time to manage stress. We spend our days putting out fires and tending to urgent matters that SEEM more important than managing our stress. But the less we manage our stress, the more scattered and inefficient we become. In order to manage this mindset we need to SET ASIDE time to do the important things like exercising, yoga, meditation, reading and connecting with friends and family every day. We need to stick to this schedule no matter how many other urgent matters seem like they are more pressing. 3). Manage your stress while it’s happening. This means managing your stress on the fly AND with no time taken out of your busy schedule, either. The two best techniques for doing this are cognitive restructuring and mindfulness. Cognitive restructuring teaches you how to recognize your irrational thinking (aka, negative self-talk which causes you boatloads of stress), and teaches you how to change it. Mindfulness teaches you how to find refuge in the present moment and thus liberate you from lots of anxiety (future-oriented thinking) and lots of anger (holding onto events that happened in the past). I like to fill my gas tank up shortly after it reaches the half way mark. With that being my “usual routine” I seldom experience the stress of running out of gas or being late for a meeting because I forgot I to fill up. It took me years to figure out just how much this one simple habit could eliminate so much stress from my life. 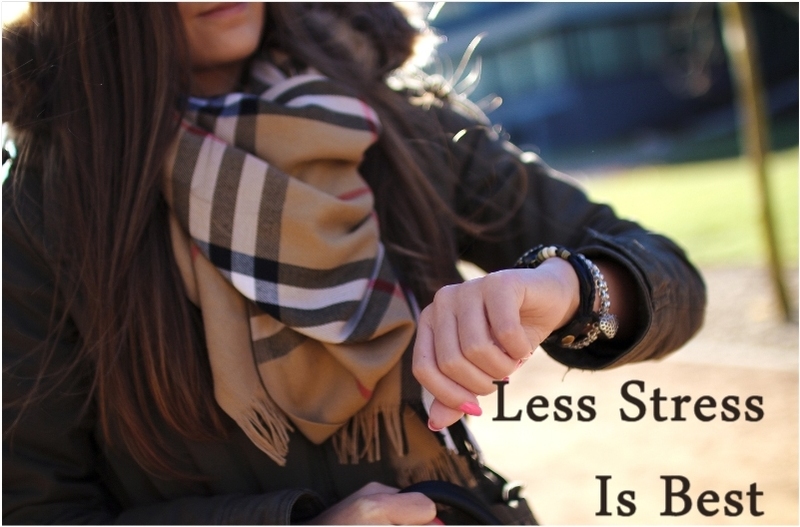 What one thing could you start today that might reduce your daily stress level? Mr. Porter also writes that some people are wired differently. The best way to deal with a wiring problem is by rewiring. You rewire your brain through affirmations, skill-building and habit formation. In addition, meditation practice can facilitate the whole process and literally change the structure of your brain. In order to address time pressure, build in extra time for things to go wrong or that take longer than you think. For relationship problems spend time every day connecting with the most important people (friends and family members) in your life. In order to address disorganization set aside time every day for planning and getting organized. In order to address financial stress, resolve to eliminate debt and put aside savings for a rainy day. Addressing these MAJOR underlying causes of stress will bring about a growing sense of inner peace that is quite simply more valuable than gold. Living a hectic, deadline driven, high octane life is not a requirement for living in the 21st century – it’s an option. We don’t have to continue these stressful habits that we’ve learned from our parents and our over-caffeinated peers and also from a culture that values material goods and profits way more than it values resilience, inner peace and personal growth. In order to survive the expansion and exponential growth of the age we live in, we can and MUST adopt new strategies to help us change ourselves, our habits, our working conditions and ultimately the stressed out world that causes us to be this way. How can you lessen the stress in your life today and start living your best life? Because we all know less stress is best.